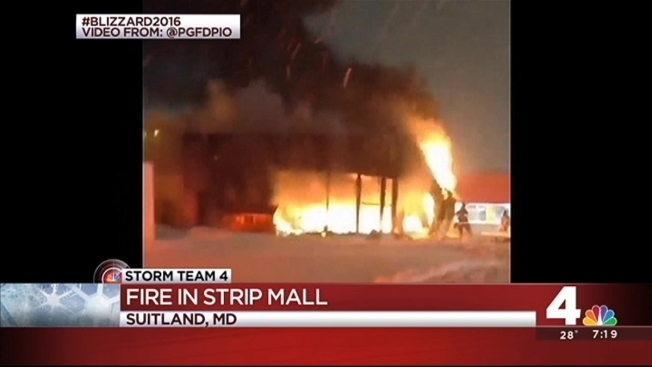 Prince George's County firefighters are responding to a large fire at a store in Suitland. A carpet store is engulfed in flames in the 4600 block of Silver Hill Road, across the street from the U.S. Census Bureau. The blaze came more than a day into a massive blizzard that has gripped the region, making fighting the fire more difficult. "The challenges are, of course, it's very, very windy blizzard-type conditions which, for one, slows our response," said Prince George's County Assistant Fire Chief Alan Doubleday. He said it also has caused the fire to spread rapidly. Crews are fighting the fire from the exterior due to the size and strength of the flames, fire officials said. Fire had emerged through the roof before firefighters were able to begin spraying water. "With no residents out on the roads today, I'm sure this went unnoticed for quite some time," he said. Doubleday said the entire strip mall, which is only about 100 feet long, belongs to one retailer.